As an antidote to stress, Mindful Relaxation offers a journey into your natural state of deep, conscious relaxation. This state has profound effects on the mind, body and spirit, and through its cultivation, the natural healing mechanisms in the body are activated. This state of deep relaxation already exists within you. Your practice becomes remembering how to access it in your daily life. Can be followed as a full practice or there are three tracks which can be done separately as stand alone meditations. 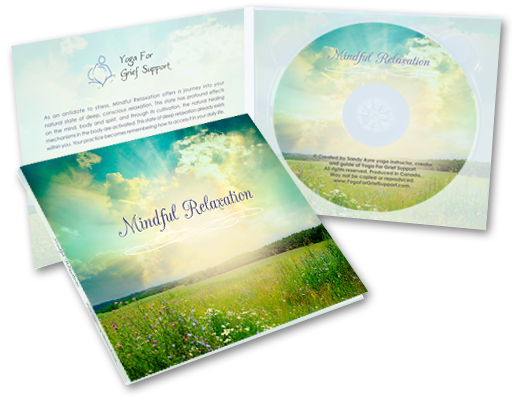 Mindful Relaxation is a meditation CD created by Sandy Ayre - Occupational Therapist, yoga instructor, creator, and guide of Yoga For Grief Support. A journey into the physical body and mind with the practice of mindfulness. Through cultivating inner awareness, a refined deep breath, and the wisdom of surrender, you will allow yourself to be taken by relaxation. A progressive relaxation of the entire body, allowing time to rest deeply in stillness and tranquility. This track ends with a blessing for yourself, integrating your right to access the deep state of mindful relaxation anytime, anywhere and in any situation. The CD comes in a nice printed case as shown above. Depending on your location, there are 3 options for shipping - please choose from the drop-down menu below for details.